Last night Stuart and I went to see Benedict Cumberbatch star in Hamlet at the Barbican Theatre in London's glitzy but Brutalist Barbican Centre. That it should come to this! Casting such a huge star and possible distraction in such a play! Though this be madness, yet there is method in't. It sold out a year ahead in minutes. What a piece of work is (this particular) man? Well, Cumberbatch is electrifying. There was nothing rotten in this state of Denmark. This Hamlet is no ham. He commands and surprises, amazes and delights. He veers from genuinely laugh-out loud comedy to the depths of tragedy in the flick of wrist, the commanding stamp of the foot and the splendid arch of the eyebrow. An early review by Kate Maltby in The Times called it "a waste" and worse. Well, the lady doth protest too much, methinks. She was trying to get a contrary knife in early. Most critics agree that this is a sublime, superb and sumptuous production - pitch-perfectly acted. And judging by the standing ovation at the end the audience concur. But let me not imply that Benedict Cumberbatch was the only star of the night. Ciarán Hinds as Claudius and Gertrude played by Anastasia Hille were excellent. Sian Brooke's Ophelia actually brought me to tears as she sang over her father's grave. The cast was rounded out by strong support from Laertes played by Kobna Holdbrook-Smith, Ghost and Gravedigger played by Karl Johnson, Polonius played by Jim Norton and Horatio played by Leo Bill. 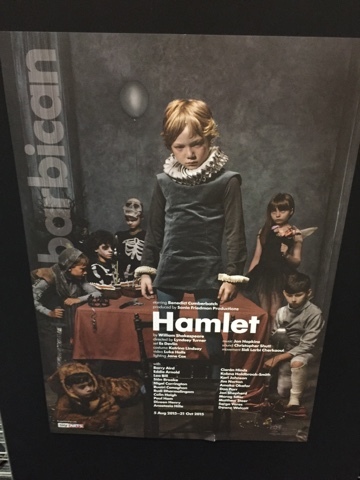 Back to Hamlet though and director Lyndsey Turner has done a truly magnificent job. Outstanding. The set design by Es Devlin is simply a wow. And even Katrina Lindsay's costume design and Jane Cox's lighting design demanded acclaim. To be, or not to be? There is no question. A brilliant, brilliant show.